Here is a translation of the sizes in "penny" to actual length. 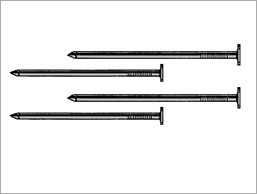 Number of pieces is estimated using common nails. Nails are rarely labelled by their length in inches. Instead they are referred to as different "penny" sizes. Here is a translation of the sizes in "penny" to actual length. 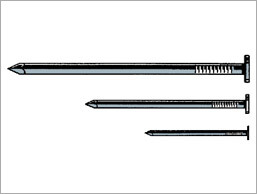 Number of pieces is estimated using common nails. CUT NAILS: Cut nails are an option for nailing flooring, where the heads will be visible. It often gives a more colonial look, and is commonly used with wide pine flooring, to help complete the look of a traditional style floor. Cut nails generally have a rectangular shaped head, which is similar to the appearance of nails when they were made by blacksmiths out of rod stock by hand. This square head is good at holding flooring in place despite the changing humidity conditions inside homes. We stock cut nails in 7, 8, and 10 penny sizes, and sell them either by the pound, or by the 50 pound box. BOX NAILS:Box Nails are a thinner shanked nail, often used for installing clapboard siding. They are especially good for this application because the thinner nail tends to crack the siding less. The nail also has a slightly larger head, which helps the nail keep the siding in place, even when the sun and temperature might cause the wood to shrink or swell somewhat. Box nails are most often used with a galvanized coating on them, so that they will stand up to the weather better. We sell them both by the pound, and in bulk 50 pound boxes. MASONARY NAILS: Masonary nails are used primarily as a fastener that you drive into concrete (or some other stone-like surface). To facilitate this, the nails themselves are thicker, and are generally fluted -- this means that they have grooves that run the length of the nail. The thicker shank means that they are less likely to bend when they are struck and driven into the hard surface. This is important, as usually a normal hammer is not enough to drive nails into concrete. Instead, it is common to use a 3 lb. or 5 lb. hammer for the job. A recent addition to this job is the power assisted fastener. This is also often a sort of masonary nail, though usually without the grooves in the shaft. They are loaded into a "gun" of sorts, at which point a charge is triggered that drives the pin into the concrete. 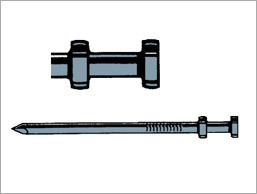 The nail has a plastic collar so that it fits into the gun, and this collar is usually crushed as the nail is driven. There are two basic types of power drivers for these nails. One is trigger actuated, and the other is hammer actuated. The trigger gun is somewhat easier to use, though its greater number of moving parts can sometimes be a liability. With this gun, you simply load the charge and the pin into the gun, pull the trigger, and BANG, the pin is driven. In the hammer actuated driver, you still load the charge and the pin into the driver. Then you simply place the tool in the right spot and strike the end with a normal hammer. The hammer blow drives a bolt that sets off the charge, and WHAM, the pin is set. We stock 1 1/2" through 3" masonary nails, and sell them by the pound or by the 50 pound box. We stock 1" through 2 1/2" power drivers and loads, and sell them by boxes of 100 pieces each. RING NAILS: Ring nails are generally of three kinds: siding, decking, and underlayment. Siding nails have rings so that the siding does not shift overly much when there are changes in temperature or humidity. They still shift, but the nails maintain their superior grip. Siding nails also tend to have smaller heads, so that they are less obvious after a top coat is applied to the siding. Decking nails sometimes are ring nails for reasons similar to the ones for siding nails. The teeth on the shank of the nail grip better, and so are less likely to pull out as the deck boards dry and weather. Where a normal smooth shanked nail might pull out over the months as a deck board dries and cups, ring deck nails hold fast. Of course, if you break a deck board, those same nails will not want to let go enough for you to do an easy repair job. Underlayment nails are used for subfloor. (That's literally what "underlayment" means.) Since few people want their subfloor to move very much, the teeth on the shank help keep the plywood (or other subfloor material) in place. Underlayment nails also tend to have a larger head, insuring that they will not pull through the material they hold in place. The larger head also helps to keep the subfloor more stable through changes in humidity and temperature. We stock duplex nails in a 10D and 16D size. Both are available either by the pound or in 50 pound boxes. CEMENT COATED NAILS:Cement coated nails are very similar to the box nail in shape. They have a thinner shank that helps reduce the chance of splitting the material you are trying to fasten. They are called cement coated because they have a thin coating of heat activated resin. When you drive in the nail, the friction between the nail and the material heats the resin enough to create a bond. Not so long ago, cement coated nails were all the rage, due to their increased holding power. Cement coated nails are still used for projects that require an extra bond, with the reduction in the chance of splitting. They are also well suited for nailing down plywood. COMMON NAILS:Common nails are named common because they are far and away to most likely to be used for a variety of applications. They are made with a fairly thick wire (i.e., they are a thick nail), and have a medium sized head. They are used mostly for framing and construction, since they can take a fair amount of weight before breaking, drive into wood relatively easily, and have a large enough head to hold timber together with a low risk of pulling through. We stock common nails not only loosely (by the pound), but also in 50 pound boxes, as well as for a number of pneumatic nails guns, including Senco, Stanley-Bostich, Makita, and DuoFast. FINISH NAILS: Finish nails are a finish carpenter's friend. They hold material in place yet can be buried into the wood and covered with wood putty. This means that there are no unsightly nail heads showing though the paint or stain. The moulding, or other surface material, is held in place underneath the surface, making the fastener almost invisible. We stock finish nails in "brites" (uncoated) and galvanized, both by the pound and in bulk 50 pound boxes. 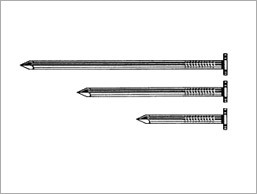 We also stock finish nails for a number of pneumatic guns, including Paslode and Stanley-Bostich. 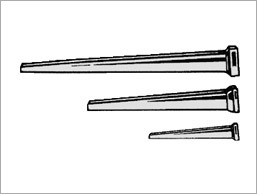 DUPLEX NAILS: Duplex nails, also called "Scaffolding Nails", get their name from the two layers on the head of the nail. This keeps the nail from being driven completely into a surface. This may seem odd, but not if you want to pull the nail back out again in the near future. 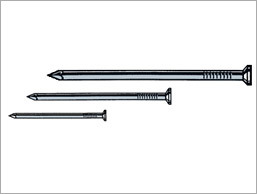 When scaffolds are assembled, it is not usually supposed to be permanent, so these nails are often used [and reused]. 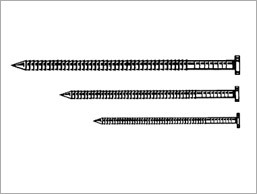 Forms for foundations and temporary hurricane barriers over windows are other common uses for duplex nails.